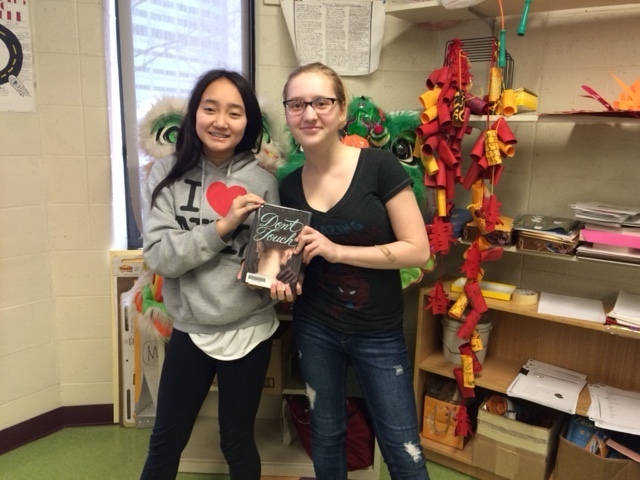 Posted March 18, 2015 by laurielmorrison & filed under Author Interviews, Student-Author Interview Series. 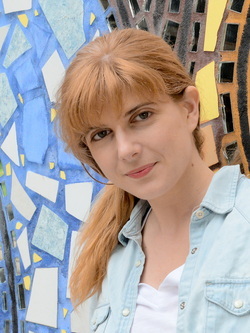 Today I’m thrilled to welcome the smart and charming Rachel M. Wilson for our latest student-author interview! Rachel is a fellow VCFA alum, and her debut Don’t Touch came out in September of 2014 with HarperTeen. Rachel also has a short story called “The Game of Boys and Monsters” out as a digital short from HarperTeen Impulse. Don’t Touch tells the story of Caddie, a talented actress who is struggling with OCD. Caddie’s parents have recently split up, and she believes that if she can keep from touching anyone else’s skin, they might get back together. Caddie longs to play Ophelia in her school’s production of Hamlet, but that would mean touching—and kissing—a boy named Peter. Don’t Touch is a powerful, satisfying novel that depicts Caddie’s compelling journey and features an endearing cast of secondary characters. It also ends with one of the most compassionate, informative author’s notes I’ve ever read. 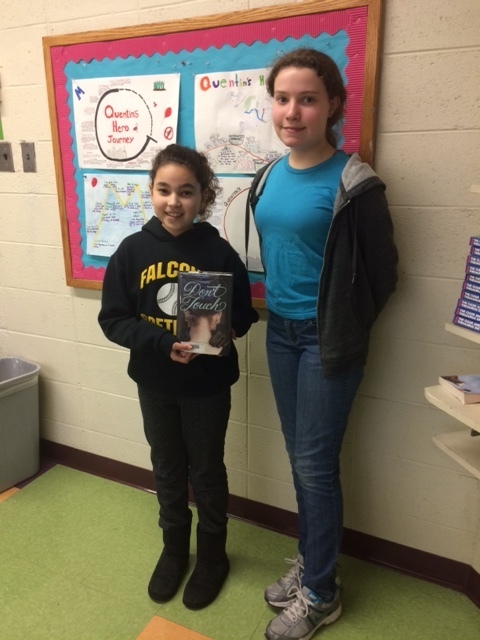 Lily, Olivia, Casey, and Mary read the book and had some great questions for Rachel. Lily: I like that the book is realistic fiction but there’s a mysterious side because of Caddie’s sort of magical idea that if she keeps her gloves on and doesn’t touch anybody she can make her dad come home. Olivia: I liked how much I could sympathize with Caddie and connect with her even though her situation is unusual. I know that situations like hers really do happen. Casey: I like how the book introduces Caddie’s phobia and how the reader gets to experience what she’s going through. Mary: I really like how descriptive the book is and how it describes Caddie’s feelings, especially. Rachel: Thanks so much, you guys! It means a lot to me to hear that the book connected with you. Lily: Have you ever been in Hamlet, and if so what part did you have? I’ve never been in Hamlet, though I do LOVE the play and have seen it many times. I’ve never acted in any full Shakespeare production. In acting class in college, I did scenes as Macbeth (yes, Mr. Macbeth), Helena from A Midsummer Night’s Dream, and Lady Anne from Richard III. In high school I almost had the chance to play Juliet, but I went to a small school and all the boys who might have played Romeo played basketball instead of auditioning. Olivia: Did you base the book of off your personal experience with OCD, theater, or both? Is Caddie based on any real people you know? I do have personal experience with both OCD and theater, though the story in the book is very different from my own. My own OCD started around age 10, and at first it had a lot to do with a fear that I might catch a disease (sometimes a fantastical disease, like, I was afraid that touching a daddy long legs spider might make my legs start growing long and never stop). Later, I had some magical thinking of my own—I had rituals like focusing on a certain color while blinking, and if I messed those up, I’d worry that something horrible would happen to people I cared about. So there’s a lot of me in Caddie, but her particular fears and her friends and family situation are made up—all of that fiction has to do triple duty in being believable, serving the plot, and serving as metaphors for what’s going on inside Caddie. I’ve always loved theater—I love it as a storyteller, and like Caddie, I love it as a way to experiment with a different way of being. I’ve always enjoyed playing at dramatic or extreme situations that rarely happen in real life. For my younger self, playing a character who was brave or outspoken or free was almost like practice for being that way in real life. Mary: I read the Q and A part in the back so I know that you’ve had anxiety like Caddie. I was wondering if it was hard for you to write about anxiety since you have experienced it, even though the book isn’t about you and your personal experiences? That’s a great question, and I’m going to answer it from two different angles. On the one hand, it was a pleasure for me to write about it because I know it so well and because it’s been a big part of my experience. It didn’t cause me anxiety to write about Caddie’s, though I sometimes felt along with her when I was into a scene. On the other hand, because I am close to it, it was challenging to make sure that what was in my head was getting across on the page. When you’re writing about something you know well, you sometimes have to do more research to ensure that you aren’t taking shortcuts and that what seems obvious to you will get across to a reader who may not have direct experience with your subject. Casey: How long did it take for you to write the book? That’s hard to say. I wrote twenty pages about a girl named Caddie many years before I wrote a draft of the book. When I did draft the whole book, it took about a year, but that first draft was very different from the final version—at one point, Caddie was a ballet dancer and had a manatee friend that she visited in Florida. It was a whole other story. I rewrote the book over the next year and then spent another two or three years with revision. Olivia: What was your writing process like? When you were writing this book, did you have a writer’s group? Did you outline it? I was in the MFA program at Vermont College of Fine Arts while I was first drafting the book, and my first mentor made me outline it, which I found very difficult. The final book is nothing like that first outline, but it gave me somewhere to go, and I probably wouldn’t have made it through a first draft without the outline. I wrote the book in a pretty patchwork way, working on scenes out of order, exploring in different directions, and writing new outlines each time something major shifted in the plot … Basically, I made a big mess and eventually put it back together again. I didn’t have a steady writer’s group, but I did bring pieces of the book to workshops at Vermont College, where I received helpful feedback, and I had a few friends read the whole book and give me notes. Lily and Mary: Did people suggest that you make big changes about how you wrote the book, and if so did you listen to them? Did the plot change, either minorly or drastically, throughout the process of writing and editing the book? Yes! As you might already have been able to tell, the book went through several pretty drastic changes before I ever tried to sell it. My first draft included many big plot threads all tangled up together, almost like I was writing two or three different books at once. My last mentor at VCFA, Martine Leavitt, gave me great guidance in focusing the plot. She suggested I pull out the threads that felt strongest and most central to the story and rewrite around those. Then, when I worked with my editors at HarperTeen, they had tons of smart ideas, especially about spending more time with several of the relationships in the book. There were some suggestions for changes along the way that I didn’t agree with—I think that’s bound to happen—but sometimes what’s bothering a reader isn’t the choice you’ve made but that you haven’t executed or supported it well enough. Sometimes instead of totally changing a scene that I liked, I was able to revise so that it worked better and earned its keep. Lily: Would you ever write a sequel to the book or a book from a secondary character’s perspective? If so, what character’s perspective would you choose? I doubt that will really happen, but I’ve thought about it—I’d be interested to explore what happens between Peter and Caddie next, maybe even from his point of view. If I were choosing to write a spin-off solely on the basis of fun, I might choose to do a connected story from Livia’s point of view. She has a refreshing take on the world, and I’d love to play with that more. Olivia: Did you like acting when you were young? Did you go to a special performing arts school? Yes, I loved acting. I did my first professional play in fifth grade—I was in the angel choir in The Best Christmas Pageant Ever at Birmingham Children’s Theater, and even though it was a little part with no lines, I was in heaven the entire time. The size of the stage and the audiences, the social time with the other kids backstage, and working with adults who were pros all dazzled me. We did annual plays at school, musical ones with limited spoken lines where the whole class sang songs on risers. We would get out of class for rehearsal, and I looked forward to those every year. I didn’t go to a special performing school, but my high school did have an excellent director who chose really sophisticated and challenging plays for us to do—we did Lorca’s The House of Bernarda Alba and Pirandello’s Right You Are (If You Think So). I didn’t always understand them at first, but I learned a lot by trying. Lily: Did you like to write when you were in middle school? Sort of. I remember my seventh grade teacher had us keep a morning journal, and I really enjoyed creating characters and stories for that. Sometimes she would have us do creative writing to support larger projects, like writing our own myths or poems, and I loved that kind of assignment. As I remember it though, our opportunities for creative writing were somewhat limited, and I didn’t think to try it on my own. I was super into visual arts and theater at the time, so I sometimes wrote graphic-novel-style journal entries or short plays for fun. Casey: Were you ever in a writing club or anything like that? No, I was at such a small school through 7th grade that we didn’t have many clubs. We kind of all did everything. I did work on the class newspaper, though, and that was both fun and full of drama. Mary: Did you have a nice teacher that inspired you to be a writer or helped you figure out your career path dream? I’ve had so many nice teachers. Thinking about middle school in particular, I remember being pulled in different directions by several supportive teachers—I was on the math team, working on special projects with the art teacher and the computer teacher, doing theater outside of school, and working on the newspaper I mentioned … In 8th grade, I started working with my new school’s theater director and with the Forensics & Speech teacher. All of these teachers were super-supportive of me and offered me a multitude of activities to try. Even though most of those activities weren’t directly related to writing, they’ve all fed my writing in one way or another. In order to write, you have to have lots of experience to draw on, so trying out a lot of different activities is a great way to go. Even now, I’m not only a writer—I’m an actor and a teacher and a freelancer with lots of odd jobs. I still believe in doing and being more than one thing, and maybe that started back in middle school. some great resources for DON’T TOUCH, like a book club guide and a REALLY awesome book trailer! Great interview. Your students ask such astute questions! I have to wonder if any of them would like to write YA. Really loved Mary’s question: “I was wondering if it was hard for you to write about anxiety since you have experienced it, even though the book isn’t about you and your personal experiences?” Such a good question. I’m glad they loved Rachel’s book. It’s wonderful! Thank you! I loved that question from Mary, too. And they do write some awesome fiction!